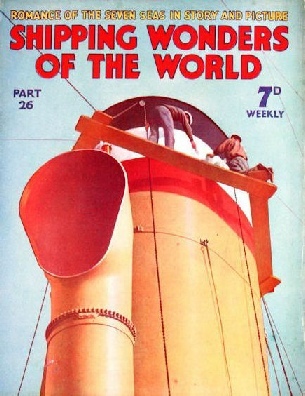 Part 26 of Shipping Wonders of the World was published on Tuesday 4th August 1936. This issue completed volume 1 of Shipping Wonders of the World. It included a centre photogravure supplement featuring destroyers of the Royal Navy, which formed part of the article on Greyhounds of the Fleet. This week’s cover of Shipping Wonders of the World shows a scene on board the Kaiser, of the Hamburg-Amerika line. The white band that divides the red from the black of her funnel must be painted every other day if it is to be kept spotless, and our picture shows men doing this. The Kaiser, 1,900 tons gross, was built in 1905, and she is 303 ft 1 in long, with a beam of 38 ft 5 in and a depth of 13 ft 3 in. The story of the Seeadler, concluded from part part 25. Queen Mary or the Bremen, neither the Georgic nor the Britannic is a large ship, they are, however, two of the world’s largest motor ships. The Britannic has a gross tonnage of 26,943, is 683 ft 7 in in length between perpendiculars, and has a moulded breadth of nearly 82½ feet. Her moulded depth is 52 ft 10 in. She is the third White Star ship of that name, the first having been built in 1874; the second, also a White Star ship, was built in 1914. The latter ship was employed as a hospital ship during the war of 1914-18 and was sunk by a mine in the Aegean Sea on November 21, 1916. The Britannic and the Georgic are sister ships, but the Georgic has a slightly larger tonnage. This chapter is by Peter Duff and is the seventh article in the series the World’s Largest Ships. A photograph of the Georgic under construction appeared in part 2. The protection of food supply ships is always of paramount importance to a nation at war. The convoy system in various forms has been adopted for this purpose by almost very maritime nation since sea transport began. The possibility of starvation in a country that depends on overseas supplies for the greater part of its foodstuffs is always to be taken into account. The first duty of the Navy is considered to be the protection of commerce, especially the food ships. This can be done by the protection of merchant ships through the danger areas by means of a system of convoys. This article is by Frank Bowen. ESCORTING A TREASURE SHIP. This photograph was taken from HM destroyer Veteran, which escorted the P & O liner Ranpura, 16,688 tons gross, on a stage of her journey to China with priceless art treasures on board. The precious cargo had been exhibited at the unique Chinese Art Exhibition at Burlington House, London, in 1935-36. The Ranpura ran aground off Gibraltar, and experienced stormy weather during most of her passage. HMS Veteran has a speed of 34 knots and her turbines have a designed shaft horse-power of 27,000. 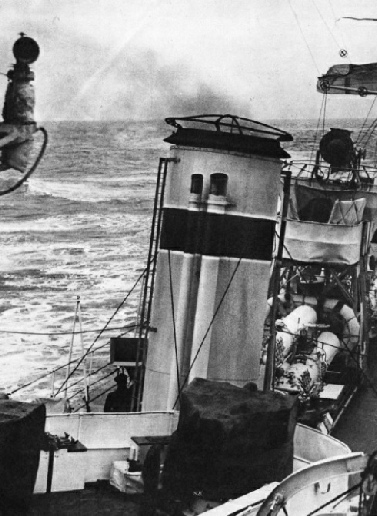 THE SPEED OF A DESTROYER is well illustrated by this striking photograph of HMS Umpire. She was completed in August 1917, and was placed out of commission ten years later. HMS Umpire was 265 feet long between perpendiculars and 276 feet overall. She had a beam of 26 ft 9 in and a maximum draught of 11 ft 9 in. 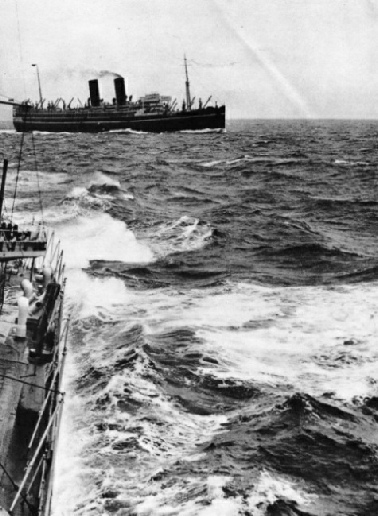 Her displacement was 1,091 tons. Six years after Christopher Columbus had sailed across the unknown Atlantic, Vasco da Gama, another great navigator, discovered the sea route to India by way of the Cape of Good Hope. This chapter is by Sidney Howard and is the fourth article in the series on Supreme Feats of Navigation. The destroyers of the Royal Navy are among the fastest vessels afloat. Their main duty in wartime is to screen the battle fleet, especially from enemy submarines and destroyers, and, if necessary, to make torpedo attacks. 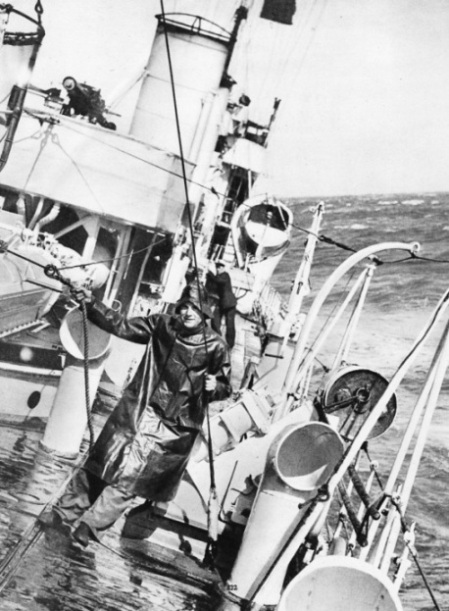 This chapter is by Hector Bywater and is the seventh article in the series The Navy Goes to Work. The city of Manchester is nearly forty miles from the sea, but the enterprise of building the great waterway known as the Manchester Ship Canal has made this city one of the leading commercial ports in Great Britain. The Ship Canal, over thirty-five miles long, connects the city with the sea and, though technically it is a canal, it serves the purpose of an elongated harbour. Running through Cheshire into Lancashire, it provides a passage to the terminal docks at Manchester and extensive deep-water facilities for large ocean-going vessels. This chapter is by A C Hardy and is the ninth article in the series on World Waterways. A DESTROYER IN HEAVY WEATHER is not a comfortable ship to be in. 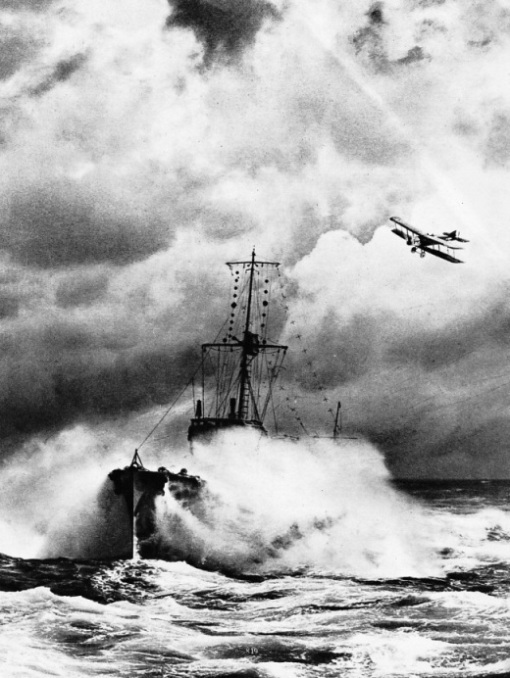 This photograph shows HMS Thruster rolling in heavy seas off Alexandria in the Mediterranean Sea. Due to be sold in 1936, HM destroyer Thruster was laid down under the Emergency War Programme in 1918. With a displacement of 900 tons, she has a length between perpendiculars of 265 feet, a beam of 26 ft 9 in and a mean draught of 10 ft 8 in. A maritime nation such as Norway produces a fine type of sailor, and the descendants of the ancient Vikings run exceedingly efficient world-wide sea transport services that rival those of any other nation. This chapter is by Frank Bowen and is the fourth article in the series Sea Transport of the Nations.